Out Of The Box Instruction Manual Concept Puts The Smartphone Front And Center | OhGizmo! As devices like smartphones become more and more capable, the learning curve for all of those features becomes increasingly difficult for those who aren’t quite as obsessed with gadgets and technology as some of us. So this Out of the Box concept, created by Clara Gaggero in collaboration with Adrian Westaway and Jaakko Tuomivara, sees the phone packaged in what is essentially a comprehensive, easy-to-follow instruction manual. 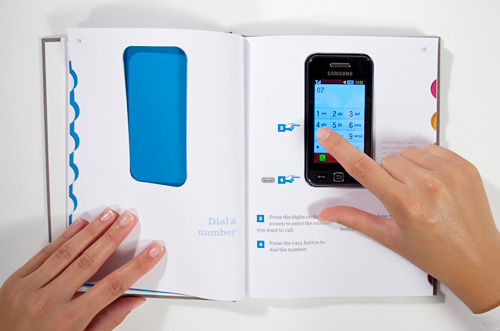 The phone sits in a cutout in the center of the book, and each page provides instructions on how to use different functions, including arrows pointing to exactly what buttons on the phone to press. Now granted it’s not as eco-friendly as a digital version of the manual, or a comprehensive tutorial built into the phone itself, but given pretty much everyone has mastered the concept of books, it’s certainly user-friendly. Now that is a Good idea, I'd have thought of that if only I'd thought of it! Clara Gaggero in collaboration with Adrian Westaway and Jaakko Tuomivara. Including arrows pointing to exactly what buttons on the phone to press.